In order to reach the village of El Gusano in the Mexican state of Guanajuato one must take the interstate to an unmarked dirt road and then travel down it for 15 kilometers. When it's dry the ride is uneventful, if bumpy and slow going, however when it rains the village can be nearly impossible to reach. El Gusano (it means The Worm—nobody I spoke with could say how it became known as that) had about 70 families scattered within its borders. Boxy cement one story buildings blended into the austere desert landscape. With so few people still living there you might not see a soul when passing through the town that seemed to be shaped from the hard, arid land itself. Young children walk to school. It's doubtful that any of these children still remain in the town. El Gusano reminded me of villages I had seen in Africa that had been nearly all abandoned because of something else: HIV/AIDS. El Gusano was decimated because of economics. Because there were so few options there for young men, the majority of them left for the United States or sought factory jobs in Mexico’s northern regions. El Gusano like rural areas in Africa was mainly populated by the elderly, women and children who were left behind. The sight of young men or even middle aged men was a rarity. During the time I spent there I was drawn to one man and his family: Cipriano Paris. Cipriano was a gentle quiet man who moved back to Mexico after working as a roofer in Texas with his brothers. When he was in Texas he grew homesick. He missed his wife, parents and extended family. He moved back to be with them and started a family of his own on the hard and unforgiving land that he knew from birth. 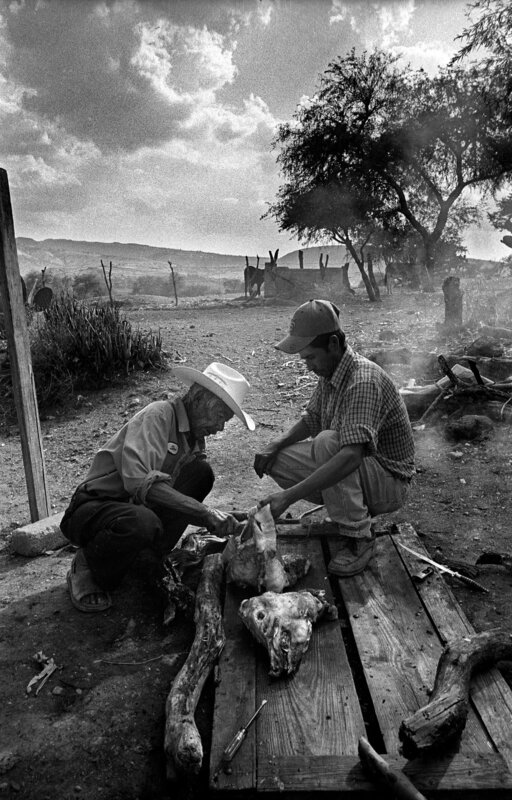 Cipriano and his father take apart a pig before roasting it. With the money made from constructing other people’s homes across the border Cipriano was able to return home and build a larger home for his family. After he returned to El Gusano Cipriano worked diligently and long hours on his farm, however he was constantly afraid of not being able to provide for his family. If the land dried up completely or his debt became too large he would have to consider joining his brothers in Texas once again. Cipriano Paris holds his youngest son Ricardo, 7 months, after working in his corn field and attending to his cattle. Cipriano Paris takes his daughter Maria Teresa, 7, to church in the back of a friend's pickup truck. Cipriano Paris' mother Laria Luisa, 71, stands in the doorway of the family kitchen that Cipriano funded with his work after working as a roofer in Texas. 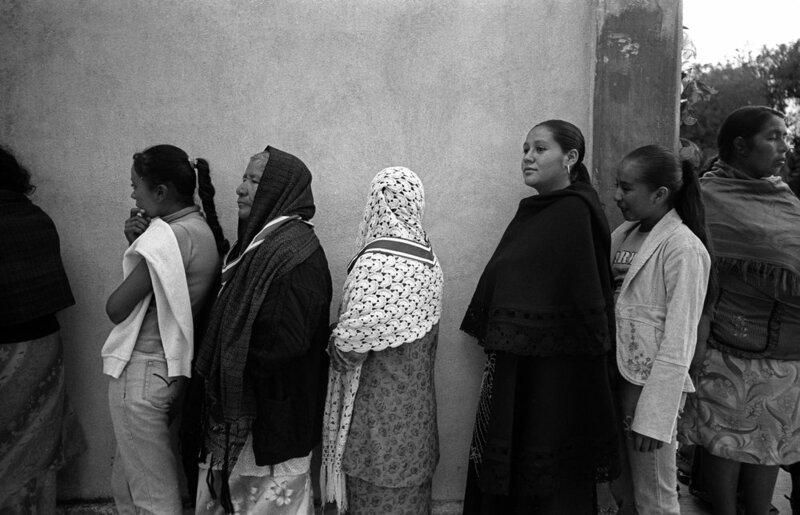 Residents of El Gusano wait in line at the village church to take communion on their saint day. During my stay I slept in a remittance house, a house constructed by money sent from abroad by a migrant who intended to return but didn’t. Although it was one of the most well-off houses in the village, nobody lived in it. In the living room there was a sofa and couple of plush arm chairs. In various corners boxes where piled up containing dresses, calendars, shoes, sewing kits, children's scissors, colored paper and glue. The bedroom was furnished with a neatly made bed that had two pillows tucked underneath a comforter. On top of the tucked away pillows where three decorative purple heart shaped pillows. There was nothing on the walls except for a few emerging cracks. There were no rugs to cover the spotless glossy tiled floor, nothing at all to suggest that anyone had ever lived there and, if the empty town is any indication, there’s nothing to suggest that anyone ever will. Natalia Ramirez Hernandez, 94. Ms. Hernandez had 12 children during her marriage. When she was 39 her husband decided to leave for the United States and she followed him to the border. He made it across. She didn't. They never saw each other again. Alone, she returned to her home in Mexico where she spent the rest of her life picking crops for other people: cotton, potatoes, strawberries, corn. She said that eight of her children died due to malnutrition. She was too poor to afford the crops that she spent her life picking. License plates of Margarita Sanchez Ramirez' husband hang next to the bathroom that was constructed by money he sent home from the work he's done in many states in the United States. She has no financial income other than remittance, however she also survives on subsistence farming (mainly corn). She never knows when or how much money she will receive when a remittance does come. A woman waits to take communion on the village's saint day. A room in the remittance house that I slept in.